It was the BC Day holiday and it was BC’s day on the field as they ground out a tough 27-20 win over the Winnipeg Blue Bombers. Here’s how I saw it, from the stands. I wouldn’t be surprised if to a man the players would say the bye week is coming at the perfect time. 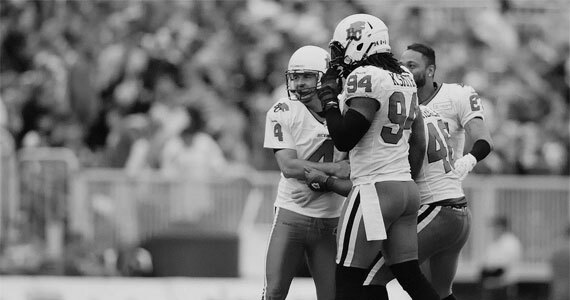 After travelling to Toronto and back, having a short week in which they only had two practices, and playing their second game in less than a week, the Lions had to scratch and claw their way to a win over the Bombers. It was a critical win, as the Lions couldn’t afford to fall another game behind the leaders in the West with another loss to an East Division team. The Lions certainly came out with a purpose on the opening kickoff after the hit of the game by Solomon Elimimian gave them an early turnover and great field position to work with. 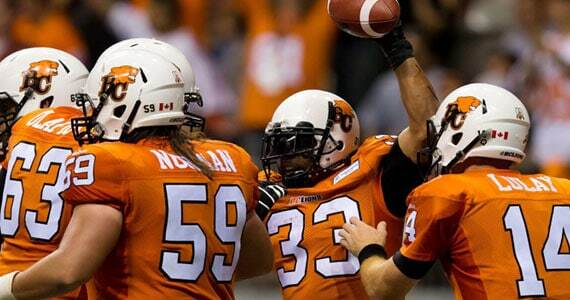 But the Lions couldn’t advance the ball and settled for Paul McCallum field goal. In fact it took the Lions until the second quarter to solve their red zone woes when Travis Lulay found Shawn Gore in the end zone after a nice fake on the end around. Elimimian made his presence felt again picking off a deflected Justin Goltz pass and two plays later Lulay zipped a ball into Korey Williams who made a great catch for his first CFL TD. Overall though the offence was average which wasn’t helped with the fact that the Bombers defence held Andrew Harris in check for most of the night. I thought the offensive line did a fairly decent job protecting Lulay for most of the night with Dean Valli stepping in for the injured Kirby Fabien. There is lots of work to be done to get the unit firing on all cylinders. It was the defence that should get most of the credit for the win. Turnovers had the Bombers in the game and Goltz looked decent in spurts. Chad Simpson and the Bombers offensive line had some success but the defence didn’t break often. After 16 points on the first half the Lions used good field position and their defence to hold the Bombers to four points in the second half. Still, there should be more concerns about the lack of pressure from the Lions defensive line as the Lions head into the bye week. Lack of pressure has been a big reason why in back to back weeks young QBs have had some success against the Lions defence, although against the Bombers it had less of an impact. But the Lions didn’t give up the big play all night, and overall, it was a strong performance. Anyone else know what Dante Marsh did to draw an unnecessary roughness penalty in the second quarter on the second Bombers touchdown? Just wondering, because I didn’t see it at the time, and the replays sure didn’t show anything. We already talked about Elimimian’s big hit on special teams to start the game and the Lions did a good job of holding to the Bombers to modest returns on the night. Paul McCallum’s coffin corner punt was a thing of beauty and led to the Bombers giving up a key safety, but the veteran did miss two field goals from 45 yards leaving this blogger to wonder why they don’t send in Hugh O’Neill for anything over 40 yards. McCallum’s shank on the late punt that gave the Bombers a hope looked to be an early snap that he wasn’t expecting. It should be interesting to see how the kicking game evolves as the season progresses, because 45 yarders are going to be needed down the stretch. Steve @TheSpecialist4: @ryan_4real21 Congrats on 150 consecutive games. All played with class, style and the right amount of flying around. Indeed, all with the Lions as well. Lions communications director Jamie Cartmell on the departure of assistant Jacqueline Blackwell, who worked her last game last night after eight seasons. She has been a great friend to me as a blogger, and I wish her all the best in her new endeavours. She’s been a big part of building the Lions social media brand. A shame indeed, but I was surprised there were as many as there were. One of the most popular long weekends of the year for folks to get away, so just fewer than 27,000 was decent. I’m still confident crowds will approach 30,000 as we head towards Labour Day and play key Western Division opponents. Enjoy the bye week everyone. Next up is a big Western Division match against the Calgary Stampeders, where we will get a real gauge of just how the Lions stack up against the West. As always, we would love your comments on the game, either here or on Twitter @BCLionsDen. Having sat through last week’s game in Calgary live, I was really hoping for a rebound performance by the Lions in their home opener versus the Grey Cup champions from Toronto. The Lions pretty much delivered on that hope with an inspired effort on defence and the play of their offensive line, both of which were missing in Calgary. Here’s how I saw it, from the stands. On the last BCLionsDen.ca Pawdcast, I talked about how the Lions had to get Andrew Harris the ball more and establish the running game to have success on offence. The Lions did just that and Harris was a dominant force in the game, both on the ground and as a receiver out of the backfield. With just five carries last week, Harris got the ball 15 times on Thursday and with a great effort by the offensive line helped open up the passing game well. Nick Moore continues to shine, racking up a 100-yard game before the half. It’s clear that he and Travis Lulay have good chemistry and faith in one another. Manny Arceneaux is showing that his return to the CFL is going to be a productive one and seems to be a lot faster than I remember him being. Courtney Taylor continues to contribute, while Paris Jackson stepped in nicely for the concussed Shawn Gore. Speaking of Gore, there should be a fine for that hit. Toronto’s Janzen Jackson launched himself head first into Gore, and even though it looked like he tried to turn, there was a huge collision to the head. These are the types of hits that football should be trying to get rid of. The Lions young offensive linemen, Matt Norman and Kirby Fabien, really stepped up in the game. When I re-watched the game I really focused on those two for several plays, and they were just stellar. It’s no surprise to me that the game ball went to the o-line. I am so impressed with Norman’s collected demeanour on the field. I think he is going to be the prefect replacement for Angus Reid and could be the next great centre in BC for years to come. Those fans (me included) that feel the offence of Jacques Chapdelaine is sometimes too predictable should have been inspired by some of the creativity shown by the Lions. The direct snap to Harris with Lulay calling out an audible was a beauty, despite it not having the desired result. It’s great to see some new tweaks being thrown into the game plan. Of course red zone production was not quite up to standard and really this game should have been way more lopsided than the score showed. Teams around the leagues must be a little worried about what they saw from the defence, particularly when Solomon Elimimian and Adam Bighill were both in the game. Both played with reckless abandon. Elimimian is so quick sideline to sideline and looked at home in the middle, with a solid nine-tackle performance. After Bighill went down, Anton McKenzie and Lin-J Shell stepped in with some solid work as well. Thankfully the Lions will have Bighill back sooner than most thought following the game. The whole defence was just swarming the ball all night long. Two, three tacklers seemed to be in on the play consistently and it was a joy to watch after last week’s game. The Lions got good pressure on Ricky Ray and held the powerful Chad Kackert to just 20 yards on eight carries. Chad Owens racked up 111 yards through the air and was really the only Argo who posed a threat on the night. The secondary was solid, with Dante Marsh showing on multiple occasions why he’s one of the best tacklers in the game and Cord Parks having another solid outing. I was looking forward to the regular season debut of returner Korey Williams. Unfortunately we didn’t get to see him break one and I wouldn’t be surprised to see Tim Brown back in the lineup against Edmonton. The Lions struggled with the return game in Calgary, and it wasn’t much better against Toronto, so it’s tough to say whether the root of the issue is the blocking or the returner. Hugh O’Neill once again handled all the kicking duties and fared well, showing a good leg on kickoffs and punts. I think the Lions will be just fine when Paul McCallum is done. McCallum should be ready to go next week and it will be interesting to see what the lineup looks like and whether the Lions choose to activate him or keep the duties in the hands of O’Neill. My worst fear about the first Thursday game in a long time in Vancouver came true and I was disappointed with the crowd of 25,255. Thursdays are tough sells in BC, with many coming from outside Greater Vancouver and from Vancouver Island. It was a beautiful night for football with the roof open and BC Place is now such a fantastic venue. Sure wish I had a dime for every person that said they didn’t go to Lions games because of the dome. Where are they now? After two years of whining, I finally have in game stats to enjoy at the game. The Lions have included them on the ribbon board that goes around between the lower and upper bowls and they are a great addition. The crowd itself was a quiet one I thought. There is still a lot of educating to do with football fans in Vancouver, who can’t seem to cheer when their supposed to (without being told) or be quiet when they’re supposed to. My solution would be more in game education from players and fans. I find the crowd reacts better to the defensive line coming on the video screen telling fans to get loud. There are all sorts of things you could to grow the culture here. The Lions need to explore these possibilities and build it into something, like the Seahawks have done in the NFL with their 12th man marketing. Lastly, I hope all Lions and CFL fans take a moment to remember the late Bob Ackles this week. It was five years ago Saturday that we lost him. What were your thoughts on the game? Leave me a comment or catch me on Twitter @BCLionsDen.